Product #21826 | SKU NL8MPR | 0.0 (no ratings yet) Thanks for your rating! 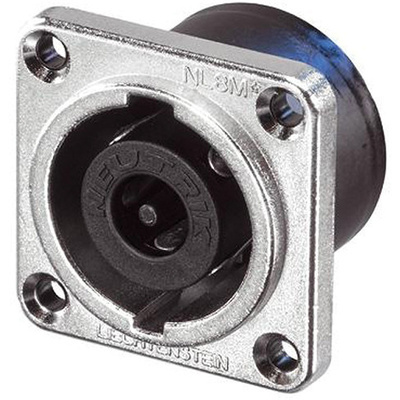 The Neutrik NL8MPR SpeakON Panel Mount Connector is designed with features such as an 8 pole chassis connector, nickel metal square G-size flange, countersunk thru holes, and 3/16" flat tabs. This connector is the standard connector for loudspeaker / amplifier interconnections. It features a unique metal locking system, making contact only once when fully locked. The speakON receptacle is robust, versatile, and easy to terminate. Note: SpeakON is NOT to be used as an AC mains or power supply connector!